This will be the last post wherein I declare my love for chubby babies--I promise. Everything about it just makes me laugh. The striped shirt. The vest. The tie. The faux handkerchief sticking out of the pocket on the vest. Anyway, I've delayed putting it on Ryan because it's been summer and I thought the outfit would be too hot for him. It's 3-6 month size and since he's only 4 months I figured I had time. Turns out, I figured wrong. "Why are you laughing at me mom?" Fat babies make the best babies. Skinny babies are good too, I once had one of those and I loved it, but fat babies are the most delicious looking babies you will ever see. Babies so fat, they have rolls in places you never thought rolls were possible. Like the middle of their calves. Babies so fat, you can't even tell they have a diaper on. Babies so fat, their stomachs hold them up into a sitting position. Babies so fat, they're happy! If you are in need of squeezing a fat baby, I've got one I'll share--come on over. Today Alexis came home with a little slip of paper. A boy in her class, a fellow bug club member, had written down his phone number for her, so she can call him to play. She's not big into getting her picture taken anymore these days, which explains the following picture. I'm not sure if you can read that, but it says "80149825". I told her that unfortunately we wouldn't be able to call him because he was missing a few numbers, I assumed it was the last few. A few minutes later this same boy called our house. Apparently Alexis successfully wrote down her phone number for him. I compared the number on my phone to the one he had written--he wrote down all the correct numbers but just missed a few from somewhere in the middle. You've got to love 6 year olds! And you've got to love this chunky, hunky 16 week old baby. He happens to be the best baby there ever was. He doesn't have the greatest hair, but he makes up for what he lacks on top by having the most squeezable thighs you'll ever see. And I just thought this picture was funny. 1. Alexis is in a bug club at school, with meetings held during recess. As the clubs solitary female member it is her job to find the bugs a good home--though I'm not sure what's wrong with their current home. Also, every time she says "bug club" I think she's saying "book club" and my first reaction is to say, "oh, what book are you reading?" 2. My right eyebrow sits just a tiny bit higher on my face than my left. As a result my glasses never look like they are sitting straight on my face. Thanks to the lady at the vision center for bringing this to my attention. 3. Yesterday I learned that if your baby poops while sitting in a bumbo, there is nowhere for the poop to go but up. And if your baby is wearing a onesie, it traps the poop so it makes a pocket of squishy poop in the middle of the baby's back at the top of the diaper. You are welcome for that visual. 4. If you take the training wheels off Tyler's bike he will become very familiar with the ground, only because he likes to go very fast and he's really bad at using his brakes. But when he's not falling, he's awesome at riding a two wheeler! 5. At 43 1/2", Alexis is the shortest kid in her class. The average seems to be about 47", with the tallest kid being 51". I tried to help her feel better about being the shortest by reminding her of people she looks up to (hardy har har) and thinks are cool, but who are also short (Hi Aunt Tricia!!). However, they are all still taller than her, so I'm not sure it worked. 6. 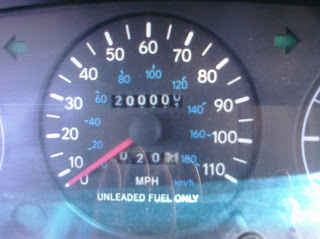 Our trusty old Geo reached 200,000 miles today. And it needs to keep on being trusty for awhile longer, so lets hope it does. It's not the prettiest car, but it's always been extremely reliable and gets killer gas mileage, so I'm going to say that buying it 5 1/2 years ago for $700 was one of the smartest moves we ever made. Jeremy pulled over and took this picture with his phone. Just think, when that Geo was made cell phones were rare, and I'm sure no one ever thought about putting a camera in one! 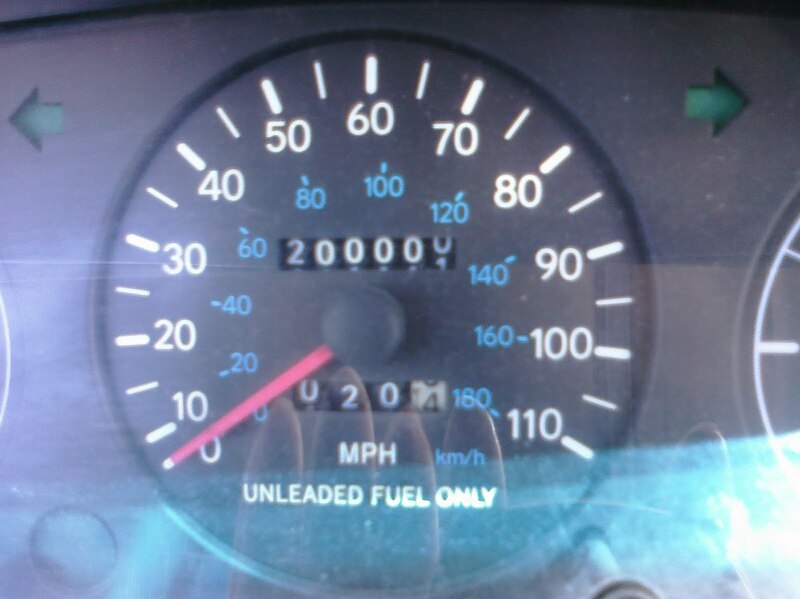 What changes that car has seen over his lifetime. I'm thankful for my husband's talents. Look at this bed he just built us! Next up: matching nightstands, and hopefully soon some new bedding. 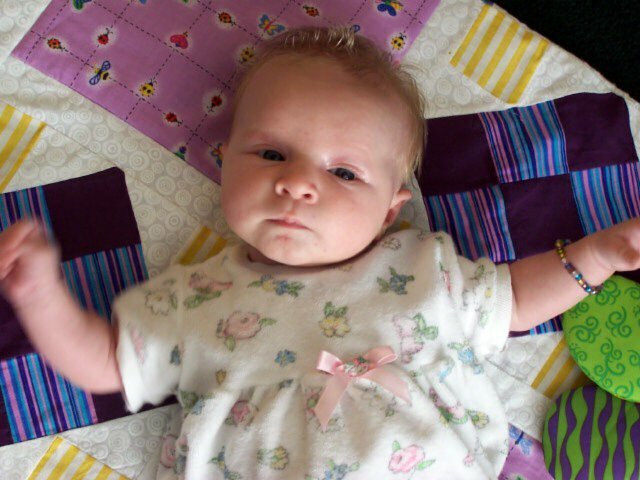 When Alexis was a baby I wanted to make a quilt for her. I knew nothing about quilting but I figured it couldn't be that hard. So I drew a picture of what I wanted it to look like, made up some measurements and went to work. The result was not super fantastic, but it is by far Alexis' favorite blanket. So, encouraged by her love of the blanket I made her, I decided to make Tyler a quilt when he was born. This time I used a pattern and actually didn't finish it until he was about a year old (see flaw #2 above). The results were better than the first, but I've still got a lot to learn. And it's not Tyler's most favorite blanket, but he likes it and uses it. Then when the third child came along I decided I wanted to try and keep up the tradition. So when I found out Ryan was a boy I started searching to see what kind of quilt I wanted to make this time. Then I stumbled across this and knew that it was what I wanted to make. She didn't explain how to make it, but it didn't look that hard--so I just guessed. I think I made the spaces too big between my squares, but I like how mine turned out anyway. It was fun to make, really easy (and technically not quilting...), and I finished it two days before Ryan was born! Honestly it's amazing I finished it at all, I really do have problems with follow through. Then, after I made it, I came across this on the web and knew I had to make another one. This time it won't be quite as orderly as the first one I made. I guess I should probably finish the other projects I've started before I start in on this one...but someday it'll get done! And maybe by then I'll care to learn how to take a good picture of a quilt, rather than just throwing it across my couch and taking a quick picture. But I don't really see that happening! I'm thankful that Alexis wears her socks like this everyday. And that they come in a variety of colors, to keep it even more interesting.